At the beginning of the 19th century, very few people bought newspapers. High tax and production costs made them relatively expensive, and apart from the Fleet Street dailies, they were often subject to irregular publishing schedules. By the middle of the century the newspaper tax had been lifted, and revolutionary new printing technology meant there was a much more systematic approach to publishing generally. 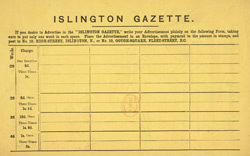 Publishers also began to understand the function of advertising: leaflets such as this would have been handed out on the streets of Islington to increase the public's awareness of the paper.